Northern Ireland offers everything you could want in a biking experience. Scenery, wildlife, exercise and all the challenge you could want. Family-friendly trails or some of the hardest natural trails you can dream of. Mountain biking is brilliant fun but gives so much more – rising to a challenge, learning new skills, appreciating the great outdoors, encouraging a healthy active lifestyle. We cater for all ability levels and our experienced and qualified guides will help you get the most out of one of the most exciting sports around. 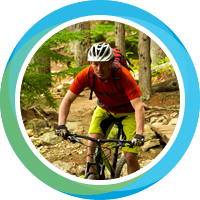 Our mountain bike guides are fully qualified and registered Mountain Bike Leaders (MBLA) and first aiders with experience in road cycling and mountain biking. From forest trails to full on natural mountain biking we can offer something for all abilities. Lurgaboy Adventure operates in Gosford, Tollymore, Castlewellan, Davagh, Belfast, Blessingbourne and the North Coast. Price includes Public Liability insurance, use of specialist equipment (mountain bike, helmet, glasses, gloves) experience and fully qualified guides. Venues: Gosford, Tollymore, Castlewellan, Davagh, Belfast, Blessingbourne and the North Coast.